INTRODUCTION: Increased complications and expense involved in marketing of new drug entities, has focused greater attention on development of sustained or controlled release drug delivery systems 1. Matrix system is the most innumerable method used in the development of controlled release formulations. It is the release system which prolongs and control release of drug that is dissolved or dispersed. In fact, a matrix is defined as a well- mixed composite of one or more drugs with a gelling agent i. e. hydrophilic polymer 2. Diclofenac Potassium is most widely used NSAID, useful in the long term therapy of rheumatoid arthritis 3. Diclofenac Potassium inhibits prostaglandin synthesis by interfering with the action of prostaglandin synthetase which explains its action. It is ideally suited for patients on sodium free diet, hypertensive patients, to treat painful inflammatory conditions of patients on diuretic therapy 4. Diclofenac potassium is soluble in water and rapidly absorbed from GIT. It has a biological half life of 2 hours and its usual dose is 50mg two to three times a day (i.e. 100 to 150 mg) 5. This makes it an ideal candidate for designing a controlled release dosage form. Few sustained release formulations of Diclofenac Potassium (100mg) are also available commercially (Flexidik – SR Tablet) 4. The development of sustained/controlled release formulations of Diclofenac Potassium is therefore of therapeutic relevance and can be used to provide a constant dosage through sustaining an appropriate level of the drug over time. Time simplest and least expensive way to control the release of the drug is to disperse it with in an inert polymeric matrix. Hydrophilic matrices are an interesting option when formulating an oral sustained of a drug. The dosage release properties of matrix devices may be dependent upon the solubility of the drug in the polymer matrix or in case of porous matrices, the solubility in the sink solution within the particle’s pore net work 6. Hydroxy propyl methyl cellulose (HPMC) is the dominant hydrophilic vehicle used for the preparation of oral controlled drug delivery system 7. Numerous studies have been reported in literature investing the HPMC matrix to control the release of a variety of drug from matrices 8-12. The object of the present study was to formulate Diclofenac Potassium SR matrix tablets using HPMC K100 polymer and elucidate the release kinetics of Diclofenac Potassium from HPMC matrices. We attempted a systematic approach to develop sustained release Diclofenac Potassium matrix tablets. MATERIALS AND METHODS: Diclofenac Potassium was obtained as gift sample from Emcure Pharmaceuticals Ltd. Pune. Materials and excipients used in preparing tablets were I. P. grades and procured from commercial sources. Preparation of SR Matrix Tablets: SR matrix tablets, each containing 100 mg Diclofenac Potassium, were prepared by direct compression technique. The drug polymer ratio was developed to adjust drug release as per theoretical release profile (Table 1) and to keep total weight of tablet constant for all the fabricated batches under experimental conditions of preparations. The total weight of the SR matrix tablets was 300 mg with different drug polymer ratios. The composition of tablets is shown in Table 1. Microcrystalline cellulose was incorporated as filler excipients to maintain tablet weight constant. This water insoluble filler was incorporated also to counterbalance the faster solubility of the drug in presence of hydrophilic polymer and to provide a stable monolithic matrix. The ingredients were passed through sieve # 30 and thoroughly mixed in a polythene bag. The powder blend was then lubricated with aerosol and magnesium stearate and compressed into tablets on a 16 station single rotary Cadmach machine. Evaluation of Physical Properties 13-15: All prepared matrix tablets were evaluated for uniformity of weight, hardness, thickness, friability and drug content, as per I.P. method. Hardness was measured by using Pfizer hardness tester. Friability was determined using Roche friabilator. Thickness was measured by Vernier calipers. Weight variation test was performed according to official method. Drug content for Diclofenac Potassium was carried out by measuring the absorbance of samples at 282 nm using UV/Visible spectrophotometer and comparing with standard Diclofenac Potassium in the same medium. In vitro Drug Release Study: The in vitro dissolution studies were carried out using USP 24 dissolution apparatus type II 16 (paddle method) at 100 rpm. Dissolution test was carried out for a total period of 12 hours using 0.1N HCl (pH 1.2) solution (750 ml) as dissolution medium at 37 ± 0.50 for first 2 hours, and pH 6.8 Phosphate buffer solution (1000 ml) for the rest of the period. 10 ml of the sample was withdrawn at regular intervals and replaced with the same volume pre warmed (37 ± 0.50) fresh dissolution medium. The samples withdrawn were filtered through 0.45 u membrane filters and drug content in each sample was analyzed after suitable dilution by spectrophotometer at 282 nm. The actual content in samples was read from a calibration curve prepared with standard Diclofenac Potassium. Kinetic Analysis of Dissolution Data: The commonly adopted model for understanding release behavior of a drug from hydrophilic matrix is a simple exponential equation 17. The in vitro drug release data were fitted in the exponential equation (Korsmeyer- Peppas equation) Mt/Mα = Ktn, where Mt corresponds to the amount of drug release in time t, Mα is the total amount of drug released after an infinite time, K is a constant related to the structural and geometric properties of the drug delivery system (tablet) and n is the release exponent related to the mechanism of the release. Table 3 shows an analysis of diffusional release mechanism obtained by various values of n . The n values used for elucidation of the drug release mechanism from the tablets were determined from log cumulative percentage of drug released versus log time plots [i.e., log (Mt/Mα ×100) versus log t]. Stability Studies: On selected fabricated tablets was strip packaged and kept at 450 with 75% RH. Samples were withdrawn at 0, 15, 30 and 45 days for evaluation of appearance, drug content and in vitro drug release. RESULTS AND DISCUSSION: The prepared SR matrix tablets of Diclofenac Potassium met the standard Pharmacopoeial requirement of uniformity of weight. All the matrix tablets conformed to the requirement of assay, as per I.P, Hardness, % friability and thickness was well within acceptable limits (Table 2). All formulation showed very low drug release in 0.1N HCl (pH 1.2). This was due to the very low solubility of Diclofenac Potassium at pH 1.2. Sustained but complete drug release was displayed by all formulations in phosphate buffer (pH 6.8). Thus it can be concluded that drug dissolution was a function of drug solubility of Diclofenac Potassium is well known. When pH rises above pKa, rapid increase in solubility occurs. The dissociation constant (pKa) of Diclofenac Potassium is 4.0 ± 0.2 at 250C in water 5. Diclofenac Potassium release from tablets was slow and extended over longer periods of time. 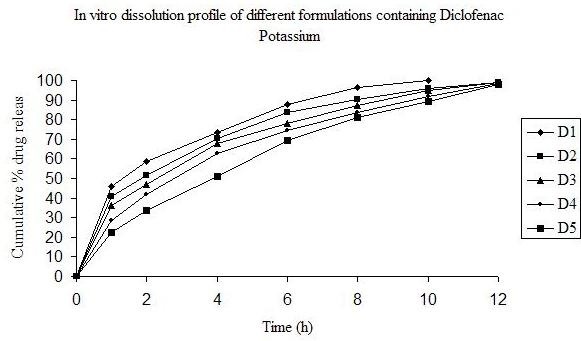 The results of dissolution studies of formulations D3, D4, D5 and D6 are shown in fig. 1. Drug release from the matrix tablets was found to decrease with increase in drug polymer ratio. Formulation D1 composed of drug polymer ratio of 1: 0.6, failed to sustain release beyond 8 hours. 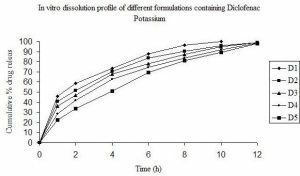 Formulation D3 with higher tablet hardness gave slower (t50 is 3.2 Hour) and complete release of Diclofenac Potassium over a period of 12 hour compared to D2 (t50 is 2.2 Hour). Hence we concluded that there is a direct relationship between tablet hardness and sustaining of the drug release. The release of drug depends not only on the nature of matrix but also upon the drug polymer ratio. As the percentage of polymer increased, the kinetics of release decreased. This may be due to structural reorganization of hydrophilic HPMC polymer. Increase in concentration of HPMC may result in increase in the tortuosity or gel strength of the polymer. When HPMC polymer is exposed to aqueous medium, it undergoes rapid hydration and chain relaxation to form viscose gelatinous layer (gel layer). Failure to generate a uniform and coherent gel may cause rapid drug release 19. In vitro release studies demonstrated that the release of Diclofenac Potassium from all the formulated SR matrix tablets can generally be sustained (fig. 1). The mechanism of release of Diclofenac Potassium from tablets D1 to D3 was quasi (Fickian) diffusion, while D4 showed behavior of Fickian diffusion (Table 3). As shown in table 3, the n values increased as the drug polymer ratio of the tablets increased. Formulation D5 showed average linearity (R2 values 0.9622), with slope n value of 0.528. This n value appears to indicate a coupling of diffusion and erosion mechanism (known as anomalous non – Fickian diffusion). Hence, diffusion coupled with erosion may be the mechanism of Diclofenac Potassium release from D5. The data for stability studies carried out for D5 tablets at 450 with 75% RH for 45 days revealed that no considerable differences in drug content and dissolution rate were observed (Table 4). CONCLUSION: It may be concluded from the present study that slow, controlled and complete release of Diclofenac Potassium over a period of 12 hours was obtained from matrix tablets D5 formulated employing drug polymer ratio of 1:1.40. It is also evident from the results that formulation D5 is a better system for SR of Diclofenac Potassium. Formulations D1 to D4 exhibited diffusion to quasi diffusion mechanism of drug release, whereas the mechanism of drug release from D5 was anomalous. ACKNOWLEDGEMENTS: The authors are thankful to Dr. N G Raghavendra Rao Professor & HOD, Department of Pharmaceutics Luqman College of Pharmacy Gulbarga, for his valuable advice regarding the research work. 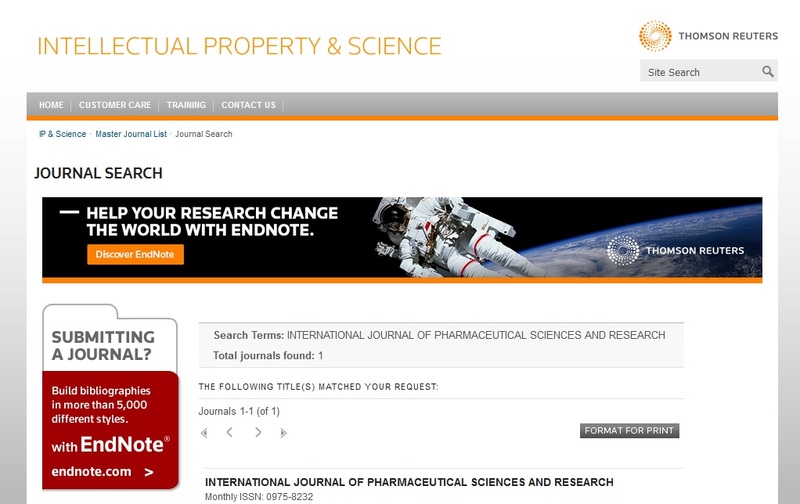 Gwen MJ, Joseph RR,:Banker GS and Rhodes CT: Modern pharmaceutics, Controlled drug delivery system 3rd, Marcel Dekker, Inc, New York, 1996;72: 575. Salsas T, Veiga F, and Pina ME: Drug development. Pharm., 1997; 23:931. Voltaflam, Product literature, Hindustan Ciba Giegy Ltd. Mumbai. Drug today, April – June 2006;1(4): 220. Cataflam, Product information, June 1994; 1061. Sing P, Desai SJ, Simonelli AP and Higuchi WI: J. Pharm. Sci., 1968; 57:217. Colombo P: Adv. Drug Deliv. Rev., 1993; 11:37. Chattaraj SC and Das SK: Drug Develop. Pharm., 1996; 22:555. Pabon CY, Frutos P, Lastres JL and Frutos G: Drug Develop. Pharm., 1992; 18: 2163. Lee BJ, Rayu SG and Cui JH: Drug Develop. Pharm., 1999; 25: 493. Basak SC, Srinivas Rao Y, Manavalan R and Rama Rao P: Indian J.Pharm. Sci., 2004: 66: 827. Basak SC, Srinivas Rao Y, Manavalan R and Rama Rao P: Indian J.Pharm. 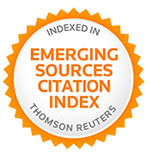 Sci., 2004; 3: 61. Indian Pharmacopoeia, The Controller of Publications, Delhi, 1996; 1:735. Indian Pharmacopoeia, The Controller of Publications, Delhi, 1996;1: 735. Lachman L, Liberman HA and Kanig JL: The Theory and Practice of Industrial Pharmacy, 3rd Varghese Publishing House, Mumbai, 1991; 88. The United States Pharmacopoeia 24. The United States Pharmacopoeial Convention, Rockville, MD, 200:1942. Langer RS and Peppas NA: Biomaterials, 1981; 2: 201. Sumathi S and Ray AR: J. Pharm. Pharmacceut. Sci., 2002; 5:12. Rajabi-Siabhoomi AR, Melia CD, Davies MC, Bowtell RW, Mejury M, Sharp JC and Mansfield P: J.Pharm. Pharmacol. 1992; 44:1062.